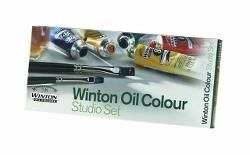 Winton Oils represent a series of moderately priced colors replacing some of the more costly traditional pigments with excellent modern alternatives. The end result is an exceptional yet value driven range of carefully selected colors, including genuine cadmiums and cobalts. 21ml tubes in 8 colors: Cadmium Yellow Pale Hue, Permanent Alizarin Crimson, French Ultramarine, Phthalo Blue, Viridian Hue, Yellow Ochre, Burnt Sienna, Burnt Umber. Set also includes 60ml Titanium White, 75ml Liquin original, color chart, and two hog brushes.